The Swallow’s Nest looks like something out of a classic fairy tale love story. Although the property has exchanged ownership many times during its long history, research does not indicate a romantic connection. As the story goes…near the end of the 19th Century, after the Russian-Turkish War (1877-1878), a Russian general and hero, whose name remains unknown, built a cottage on the site of today’s castle. 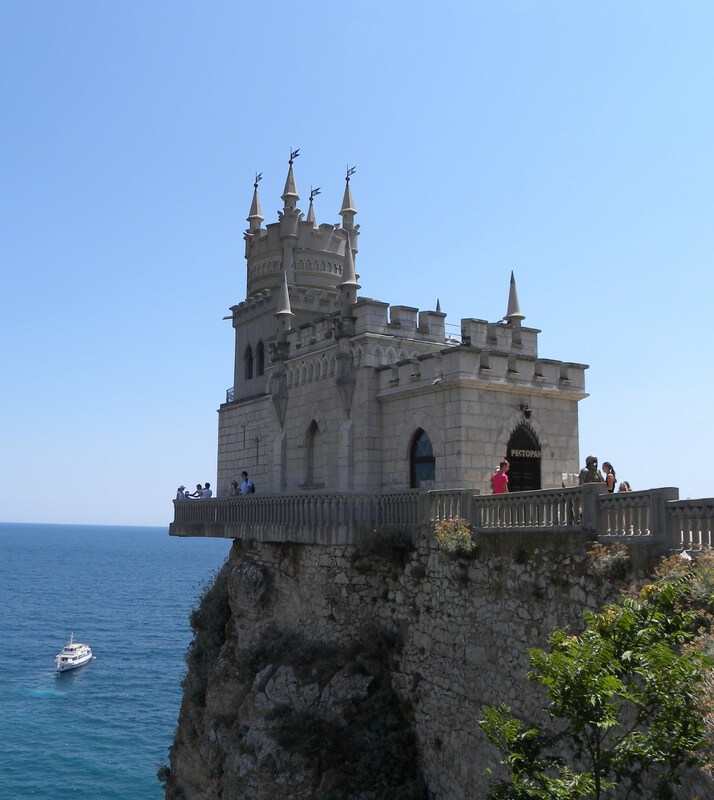 He called the meager wood building, “The Castle of Love.” The reason for the name is unknown, but legend suggests that the general built the home out of his love for the beauty of Crimea. He was looking for peace and tranquility upon returning from battle and his perch on this rocky crag overlooking the Black Sea certainly satisfied his need for solitude. Still today, the castle on Aurora Cliff is obscure from the road. It is uncertain when the general turned the wooden cottage over to its second owner, A. Tobin. What is known is that upon his death in 1903, Mr. Tobin willed the home to his wife, Moscow businesswoman, Rakhmanova. In 1911, Rakhmanova sold the home to German oil tycoon, Baron von Steinhel. During the following year, the Baron contracted architect Leonid Sherwood to design a castle to replace the small wooden cottage. His dream resulted in a miniature castle that he called the “Swallow’s Nest.” The castle is reminiscent of the Gothic style grand castles of his homeland. 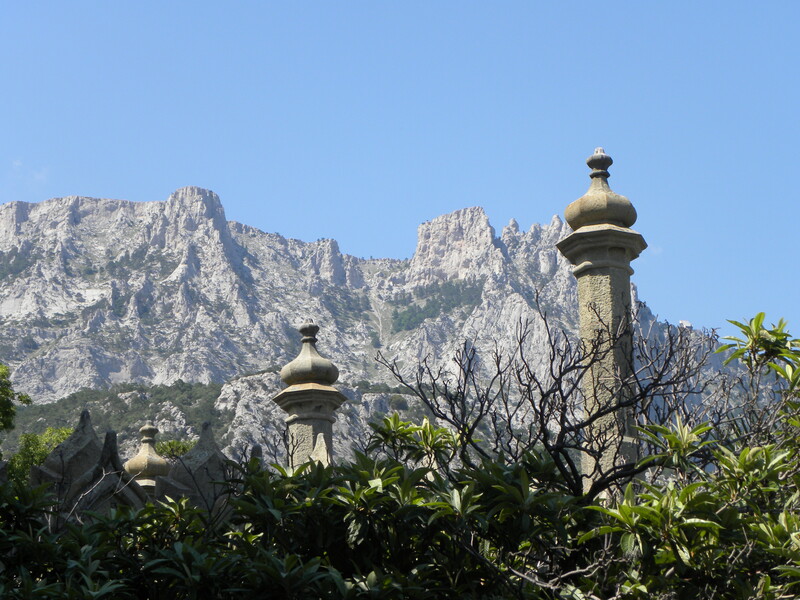 The Baron surrounded his castle with gardens which thrived in the mild climate of the Crimea region. Soon after the castle was complete in 1914, Baron von Steinhel lost interest in his project and the building was again sold; this time to a Russian businessman who converted the Swallow’s Nest into a restaurant. There is little known about the history of the castle between 1914 and 1927. As a result of a massive earthquake in 1927, a portion of rock under the castle’s foundation fell into the sea, taking the surrounding gardens with it. For the next forty years the Swallow’s Nest remained off-limits to tourists, and sat there resting on its perch overlooking the Cape of Ai-Todor. It was not until the late 1960s, that the owner made repairs to reinforce its foundation and the castle again became a restaurant in 1970. I was lucky to have lunch at the Swallow’s Nest during my visit. The views from the restaurant are spectacular, as you can imagine. The castle itself is rather small, with only a few rooms. One can only imagine what this obscure little parcel of rock overlooking the sea must have been like back when the Russian general built his wooden cottage, in search of peace and solitude. It is ironic that today you can make your way to the Swallow’s Nest just by following the throngs of tourists. The area leading up to the castle has a market of local vendors selling home-made items and souvenirs. This commercialism is a contrast from the early days of the Swallow’s Nest. Yalta itself holds historical significance, being the site of the Yalta Conference. During the conference in 1945, Winston Churchill, Franklin D. Roosevelt and Joseph Stalin met at the “Great White Hall” within the Livadia Palace, to decide the fate of post-war Europe. 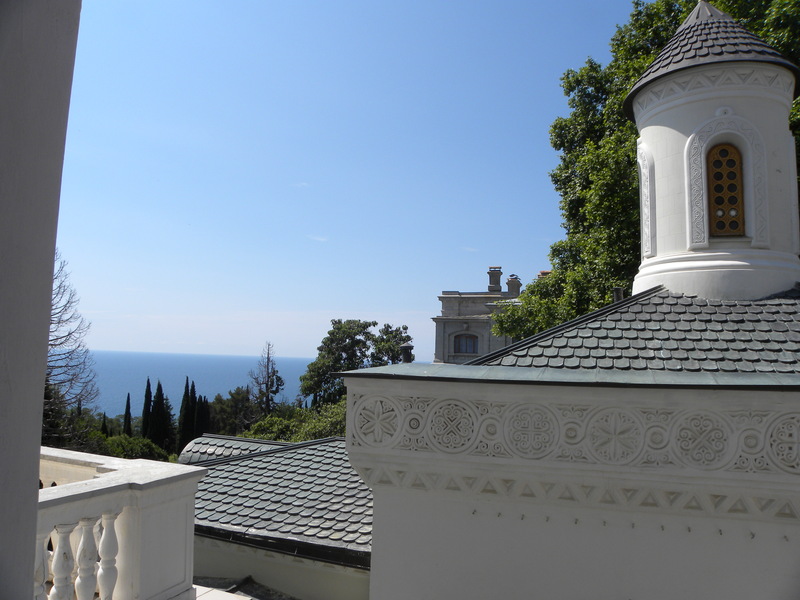 View of the Black Sea from the Livadia Palace, depicting the architecture of the palace. 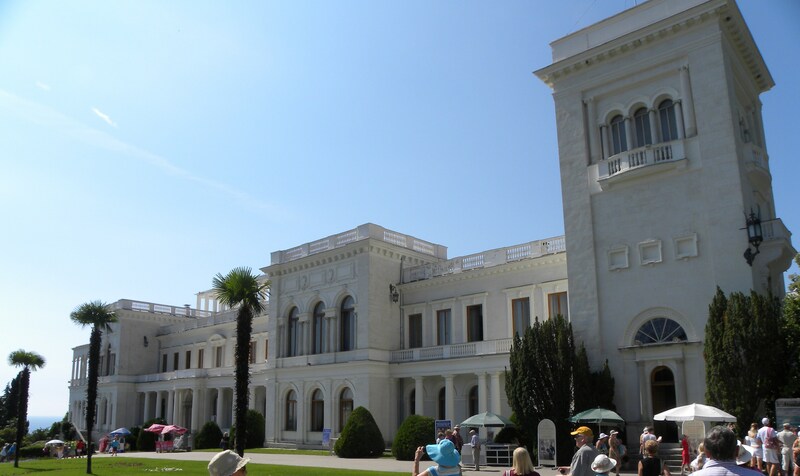 The Livadia Palace was the summer residence of the last Russian Tsar, Nicholas II. 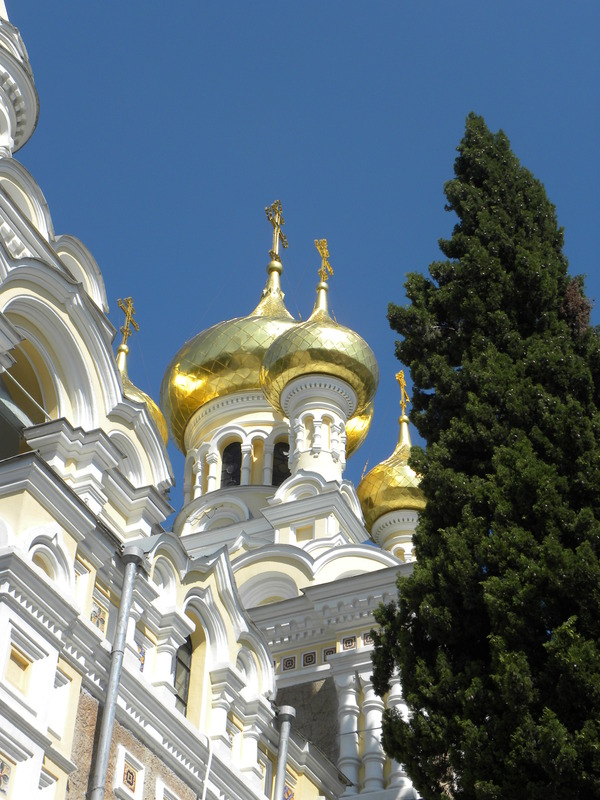 Built in Italian Renaissance style in 1911, the white palace gives visitors insight into the life of Russian aristocracy during the early 20th Century. The Palace was the setting for the Yalta Conference held in 1945.